The AV campaign represented a chance to transcend Westminster party politics and engage in a genuinely inclusive debate about how we are governed. Both the Yes and No camps have however adopted the kind of techniques that already put many people off party politics. They seem uninterested in properly explaining the real, if subtle, differences that distinguish AV from First Past The Post. On the surface, the campaigns appear free of party allegiance. Celebrities, including Eddie Izzard and Kriss Akabusi, launched the Yes campaign as ‘politician free’. The No campaign has also steered clear of known political figures where possible, although Alan B’Stard has weighed in on its behalf. No organised an open letter to the Times in favour of First Past the Post, signed by a number of television celebri-historians. But the mark of party is there, however covert it might be. During the last election Eddie Izzard appeared in a Labour Party Election Broadcast, and is closely linked to the party. Many of the No historians are active Conservatives – one is even a sitting MP. As someone who is studying political posters I can see that both campaigns are also issuing what are, in effect, party posters. 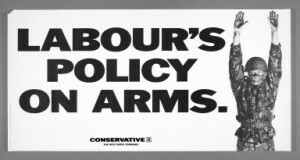 The No poster, He needs bulletproof vests, even harks back to the famous 1987 Conservative effort Labour’s policy on arms. The posters respectively claim that a vote in favour of AV or Labour will weaken our national defences. 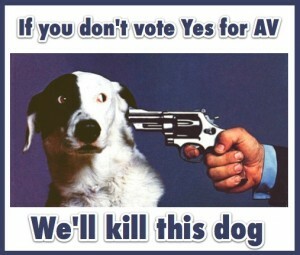 As the No campaign also needs Labour voters it simultaneously launched a poster that claimed that the implementation of AV would take money from the NHS. Instead of soldiers, babies will die. It’s not a subtle message. Both campaigns have also adopted the well-established strategy of using posters to attack unpopular individuals associated with the other side. The Say No To President Clegg is as Benedict Pringle stated a classic party attack ad, as the No camp plays on the unpopularity of the Lib Dem leader. 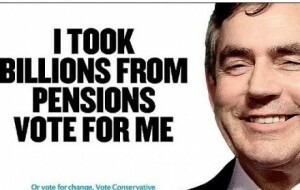 That’s why so many Conservatives posters produced during the 2010 campaign featured a grinning Gordon Brown. The Yes campaign returned the compliment. 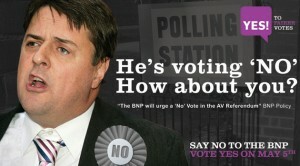 Following the BNP statement outlining its opposition to AV, it released a poster that asked whether voters were prepared to align themselves with Nick Griffin. 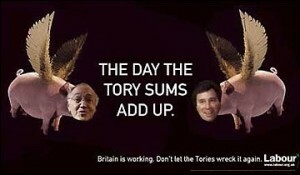 In a similar way Labour exploited – rather controversially – the unpopularity of Michael Howard and Oliver Letwin in 2005. The Electoral Commission’s guide to the referendum states: ‘Campaigners in the referendum will explain why they think you should vote “yes” or “no”’. These posters are not really explaining anything; they are not appealing to reason but to emotion and prejudice – not, you might think, the best basis on which to weigh up the pros and cons of electoral reform. As a student of party posters it is immensely frustrating that I cannot definitively assess their effectiveness – and nor can those who commission and create them. Perhaps in this instance, it’s just as well. We might ask, however, what impact another campaign that treats people as idiots will have on already disillusioned voters. The answer, presumably, will be in the turn-out. You’ll like this one. It just explains why FPTP isn’t great without any reference to politics. I’m guessing you’re a no as the top poster for the yes campaign is a spoof, while the next 2 from the AV campaign are genuine no posters. Balanced? I think you are being a little sensitive. The top picture is a spoof – but one that could have been made at the expense of either campaign. The assigned person should know how to organize all the scenes to have a result that would make sense to the viewers. other accessories without blocking any ingress or egress point. the day of the expo. may be following you, this simple precaution can help you get away without any injury or risk. EOS 60D could entirely capture images even quick on going scenes with an unbelievable accuracy of image quality. When I talk about resources I am mainly referring to the key three which are bandwidth, hard drive size, and frame rate. The car is a place that we spend a considerable amount of time, and a place where accidents can occur and road rage can be experienced or witnessed.